Over the past four decades Ruth R. Wisse has been a leading scholar of Yiddish and Jewish literary studies in North America, and one of our most fearless public intellectuals on issues relating to Jewish society, culture, and politics. 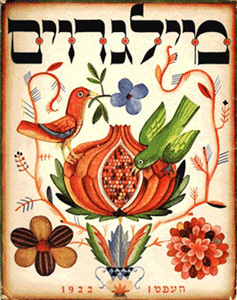 In this celebratory volume, edited by four of her former students, Wisse's colleagues take as a starting point her award-winning book The Modern Jewish Canon (2000) and explore an array of topics that touch on aspects of Yiddish, Hebrew, Israeli, American, European, and Holocaust literature. Arguing the Modern Jewish Canon brings together writers both seasoned and young, from both within and beyond the academy, to reflect the diversity of Wisse's areas of expertise and reading audiences. The volume also includes a translation of one of the first modern texts on the question of Jewish literature, penned in 1888 by Sholem Aleichem, as well as a comprehensive bibliography of Wisse's scholarship. In its richness and heft, Arguing the Modern Jewish Canon itself constitutes an important scholarly achievement in the field of modern Jewish literature. In honor of Ruth R. Wisse / edited by Justin Cammy [and others]. Cammy, Justin, "Arguing the Modern Jewish Canon: Essays on Jewish Literature and Culture" (2009). Jewish Studies: Faculty Books, Smith College, Northampton, MA.